Our gyro-stabilized camera gimbal provides smooth full HD video and amazing perspectives. Our team of creative cinematographers and editors provide industry leading quality. We pride ourselves on using flexibility, creativity and positive attitude to accomplish every project. Contact us for details on how we can help profile your event or property! Of course we shoot outside, but we can also shoot your plant tour inside. We shot a number of video and photography plant tours with our drone system. Here is a raw clip from the recent shoot showing our two man crew at work.The VLOS visual line of sight is where we excel in safety with our two man crew. The pilot keeps his eye on the drone at all times during the flight, while the navigator views the imagery and directs the shot. What a beautiful day to fly with 150 of our newest friends. The design for the logo was setup and perfected with CAD and positioned everyone properly for the best shot. Marketing and promotion has always been a priority to any business for attracting customers and investors. Now with the proliferation of social media and online video, the need to stand out has become even more important. Our St Louis Aerial Drones can offer a company those fresh new camera angles for corporate marketing videos, website photographs, presentations to investors or updates to the board of directors. Whether it’s an aerial view of that new industrial complex, an advertising campaign or marketing photographs of the corporate headquarters, we can provide a creative new perspective. We’re ready for takeoff and focusing on the big picture! Commercial and residential Realtors, brokers and agents should be using drones to increase their marketing reach to potential clients. Sweeping aerial images of neighborhoods, rolling hills, distances to schools, shopping and other amenities can be an instant draw. Brokers and agents using drone technology are getting a big advantage over their competitors. 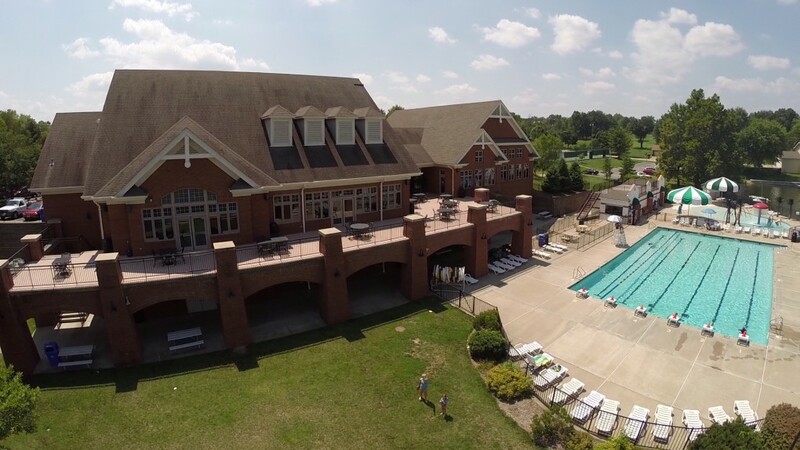 Here is a beautiful club house area we just shot with our drone fleet in the St Louis area. We provide professional aerial photos and video for commercial properties of all kinds. Aerial photographs of your business location are great for marketing materials. High resolution images for use in all media — printed collateral materials, trade show displays, newsletters and the web. For businesses, corporate headquarters and multiple office branch locations. Aerial photos that showcase your geographic footprint. For Commercial Property Owners. Whether it’s for insurance or real estate purposes we can capture your commercial property in the best light. We can provide your business with aerials from start to finish, showing stages of any construction project. Use those pictures in your marketing efforts or on your website to impress potential customers and to demonstrate your capabilities. Only an aerial photograph can provide you with a “birds-eye” view of potential building sites, showing surrounding features you just can’t see and appreciate from the ground. Record the progress of a construction job on a periodic basis, to keep a permanent record for legal, billing, or archiving purposes. Drone aerial photography and video for insurance firms. It is sometimes critical to document events like storms, tornado’s, fires, any and all damages for insurance purposes, whether you are the insurer or the policyholder. Making sure there is a permanent record of such events can protect either party in the event of a claim or a disputed claim. We can help with hard evidence to support your case.